Hello friends and welcome back! This is a very exciting post for me because it is my first ever blog post on my new MacBook Pro! This is also the first video I've edited using my new computer and I hope it's the quality your used to! If anyone has tips or tricks or apps that they love for this type of stuff for Mac let me know in the comments! I'm finally bringing back the Stretch Your Stash series back! I've been busy with design teams and other collabs, but it's time to bring it back. I hope you enjoy this version which features a new use for fabric flowers. This layout features five, yes five, photos! I haven't included this many photos on a single 12x12 layout in so long! It tells the story of our pumpkin picking adventures from autumn 2016. It wasn't any special story, but it was fun. Below is my process video for this lovely autumnal layout and I hope you enjoy! This layout starts out with a dark brown cardstock background. I then layer various patterned papers to create a fun strip. The light woodgrain pattern is from DCWV and the orange polkadot is from My Minds Eye (I think). I cut both of these pieces to created a place for my main photos to live. My main photos are cut to 4x4 and then matted on white paper. I included a strip of Freckled Fawn's floral washi tape to make the seam less abrupt. I also used a border from K & Company to include more red, but this ends up getting covered up mostly in the end. My other three photos are part of a photo strip. I first mounted them on white cardstock and then evenly spaced them on some bright yellow-orange cardstock. 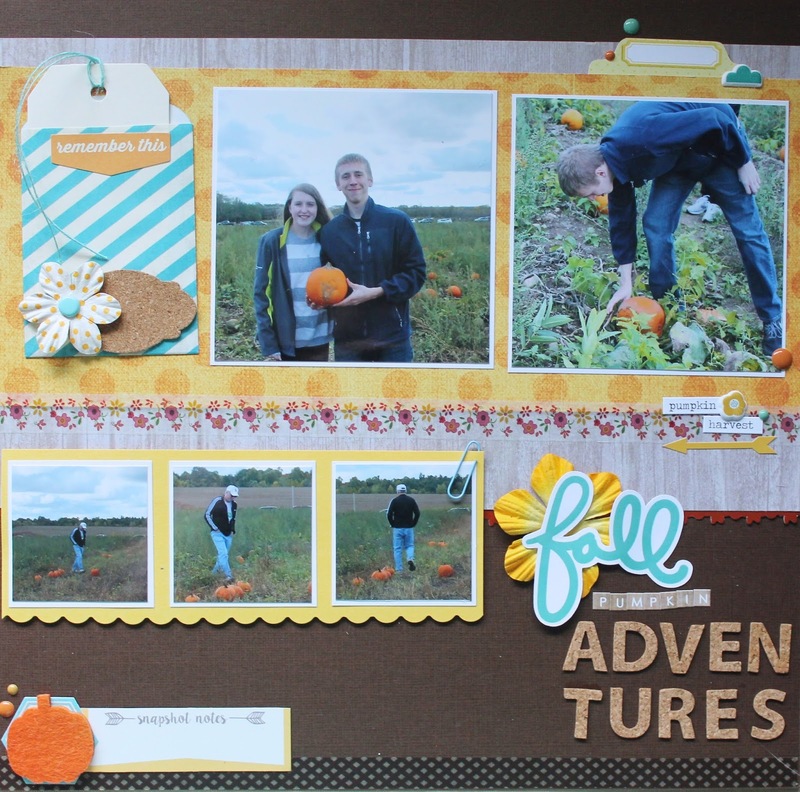 I used a Fiskars scalloped border punch to add more interest. There's also foam under this section to add more dimension. I created a cluster in the bottom left of my layout since there was a lot going on at the top. I started by adding a Basic Grey border strip of this plaid pattern. Then, I used an Elle's Studio cut apart as another journaling spot. I used a Jillibean Soup hexagon sticker as a pop of color behind my felt pumpkin. Lastly for this cluster, I scattered some enamel dots from Echo Park. I included a Pretty Little Studio tab die cut for a place to include my date. I also used an Amy Tangerine puffy cloud sticker to add dimension. To the left of the large photos, I used a pocket from Paper Studio to include a hidden journaling spot. The tag in that pocket is from Recollections and I put some teal twine to add more texture. Lastly, but most importantly the title and my example for the stretch your stash flowers edition. Fabric flowers are a great layering piece. I may do another video using more flowers as main layers if you guys would like to see it. My title pops because of this flower. The title is made out of a Pretty Little Studio die cut, Webster's Pages letter stickers, and Freckled Fawn cork alphabet pieces. This layout was so much fun to make! I hope you enjoyed this idea for using your flowers. I know that I still have plenty to use. Do you have any ideas for a stretch your stash concept? Post them in the comments below so I can see them. Thanks for stopping by!